That was certainly an accurate forecast! Hence in September 1954 a letter was sent to the V bomber firms with data for a possible missile3. At this point the design had not been thought through in any detail, and there were up to six different possible configurations under consideration, some with ramjets and solid boosters, others with liquid fuelled rocket motors. The V bomber firms had then to start thinking how they were going to carry the missile on the aircraft. Vickers, who made the Valiant, were the initial favourites for the contract, which eventually, despite misgivings, went to Avro. The extant papers of the Ministry of Supply give no real reason at all for the choice. Avro had no guided weapons expertise, and had to set up a special department for the purpose, headed by RH Francis, who had previously worked at RAE. His approach was the more measured one of a government department rather than the more urgent and commercial approach of a firm engaged on an urgent defence project. The Air Staff had specified a missile to be available by 1960, and by about 1965 the missile would effectively have become obsolete since its range was only 100 miles. By this date, it was expected that the Russians would have developed defence in depth, so that a combination of missiles and interceptor aircraft would mean that the bombers would not be able to reach their release points unscathed. Hence its service life would be short. It need not be a particularly sophisticated design, but it did need to be in service on time. Given the performance limits, light alloy would have sufficed for the structure. 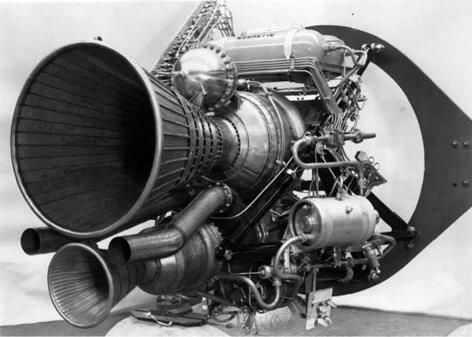 Propulsion could have been by turbojet, ramjet or rocket motor. Unfortunately the design produced by Avro was a good deal more sophisticated than was necessary. The airframe was to be built from stainless steel, a difficult material to work with, particularly when it came to bending it in two planes at the same time. A rocket motor was chosen for propulsion, and this would have a considerable impact on the serviceability and availability of the missile when it entered into service. Blue Steel was not a ballistic missile, but instead was controlled like an aircraft. It was intended for release from the bomber at around 40,000 ft. The aircraft would be travelling at around Mach 0.7 or so. After release, it dived down, and after 4 seconds, at around 32,000 ft, its motors lit up. From there it climbed to around 59,000 ft, then increased speed to Mach 2.3. After that, the missile began a cruise/climb, using only the small chamber of the rocket engine, to over 70,000 ft. When it ran out of fuel or arrived at the target, the motor cut, and the missile dived down to its target. The engine designed for Blue Steel was designated the PR94, which became known as the Stentor, built by Armstrong Siddeley (later to become Bristol Siddeley). Early test versions used the de Havilland Double Spectre engine until the Stentor became available. The Stentor had two combustion chambers, one of which was of fixed thrust of 25,500 lb at 45,000 ft, the other was to have a variable thrust of between 1,000 lbf and 6,200 lbf at 45,000 ft, and was capable of being throttled. Burning HTP and kerosene, it produced an S. I. of around 220. The large chamber was intended for the boost phase to high altitude; the small chamber for the cruise phase thereafter. The motor turned out to be reliable and effective; so much so that when reports of the failures of the early rounds stated that the rocket engine had failed, the chairman of Armstrong Siddeley wrote a sharp letter pointing out that this was not the case: the engine had been starved of fuel as a result of sloshing in the tanks. He did not want his company associated with the poor reputation the missile had at that time. The Stentor chamber was the first HTP motor to be made from tubes braised together and formed into shape, rather than the double-walled chambers such as the Gamma or Spectre. The small chamber would, in the course of time, go on to power Black Knight and Black Arrow. Avro tested the aerodynamics on a 1/8th scale model, moving up to a 2/5th scale model. These were tested by using solid fuel boosters to launch them at the RAE range at Aberporth in Wales, then variants made of light alloys rather than stainless steel were tested. For full scale missiles, the range at Woomera was brought into use, which entailed further delay as specially equipped Valiants had to be prepared (although the Valiant was not to carry the operational weapon, they were used in early trials). There was an attempt to speed up the testing by doing trials at both Aberporth and Woomera. This turned out to be a mistake. Two aircraft had been converted for trials purposes, and so one was based in the UK and the other in Australia. The problem was that they would frequently go unserviceable. If two aircraft had been available in Woomera, then the other could have been used as a back-up. The problems were many and varied. The Auxiliary Power Unit, made by de Havilland, was particularly troublesome. The unit used HTP, which was catalytically decomposed, and the gases produced then drove a turbine that in turn drove the generator. Sloshing of the fuel caused problems as the missile went through some vigorous manoeuvring as it climbed, levelled off, then went into its final dive. The weapon was supposed to have been ready to enter service by 1960. In April of that year, the first three rounds of the final version of the missile had been fired at Woomera and each had failed to follow the launch programme. The minutes of the second meeting of the Blue Steel Management board talk about Avro’s ‘dismal record at Aberporth’5 when talking of the delays in flight testing. The first round approximating to the final version was not successfully flown until 1962. In addition to work being done on the missile, a considerable amount of work had to be done on the V bombers to prepare them for the missile. The large size of the missile meant that it was carried semi recessed into the fuselage. One of the problems with the Victor bomber was that its ground clearance was quite small – there is a story (quite possibly apocryphal) that the only way to get the missile under the bomb bay was to deflate the tyres of the trolley carrying it, so as to give sufficient clearance. Figure 34. A Blue Steel missile being serviced in a hangar. Blue Steel came into service at a time when Britain’s deterrent policy was changing rapidly. It had been originally intended to extend the operational life of the V bombers until Blue Streak was deployed in the mid-1960s. When Blue Streak was abandoned in favour of Skybolt, the need for Blue Steel was far less acute, since the Air Staff hoped to have the first squadrons of V bombers equipped with Skybolt deployed by 1964. To the consternation of the British Government and the Air Staff, Skybolt was cancelled at the end of 1962. Some rather tense negotiations led to the Nassau Agreement, whereby the United States agreed to supply Britain with Polaris missiles. The drawback was that it would take some years to build the submarines and equip them with the missiles, and so Blue Steel would have to soldier on long past its ‘sell by’ date. The Treasury was adamant that there would be no more money for Blue Steel and the V Force. The only way that the bombers could now penetrate Russian airspace was to fly as low as possible: a role in direct contradiction to the design of both aircraft and missile, which would now be launched at an altitude of 1,000 ft.7 This would halve its range, making the system even less viable. This was not the only problem. The one advantage of choosing a rocket motor was that the missile did not need an air intake, and as a result its radar cross section was very much less – in modern jargon, it was ‘stealthier’. The use of HTP gave rise to a whole host of other problems. The first and unexpected problem was that aircraft de-icing fluids exploded when coming into contact with HTP, which necessitated a rapid change in procedure for de-icing during winter. The time needed to prepare a missile was of the order of seven hours. One option was to keep some missiles partly prepared, which might mean filling with HTP. The HTP had at some stage to be drained out of the missile, and the tanks were then flushed out with water and dried. Only one drying unit was provided for each station, so that after a full-scale exercise or sudden emergency, it could take as long as two weeks for the station to recover its normal peacetime preparedness! The use of HTP also meant obtaining safety clearances from the Ordnance Board and Nuclear Weapons Safety Committee. Worries about safety meant that the Nuclear Weapons Safety Committee withheld the authority to fuel the missile on the aircraft when the warhead was fitted, the authority to fit the thermal batteries to readiness missiles and the authority to fly the aircraft with the warhead fitted to the missile to a dispersal base. Thus for a considerable part of its service life, Blue Steel could have fuel, or a warhead, but not both. Blue Steel was only intended as an interim measure, and the Air Staff issued two further Operational Requirements, OR 11498 and OR 11599. These were for air-launched missiles, but ones with much greater ranges. The extra range effectively ruled out a rocket powered missile: the only way such ranges could be achieved was with an air-breathing missile using a turbojet or ramjet, and as such are beyond the scope of this book. In considering Blue Steel and any possible developments of it we must take note of some pretty unpalatable facts. We first started thinking about this weapon in 1952. The OR was accepted by the Ministry of Supply in 1954 for an in service date of 1960 and events have I think proved that had this date been met the weapon would have had a useful and viable life. An in service date of 1963 for a weapon with a range of only 100 miles is however a different matter. In all the circumstances I cannot see that we would be justified in pouring more money into the development of a weapon which has made unsatisfactory progress to date and which remains dangerously close to being a non-viable weapon at the time of its introduction into service. There was also the fear among the Air Staff that if Avro were given the go – ahead to start work on any of the improved versions then there was a good chance that Mark I might be delayed even further. 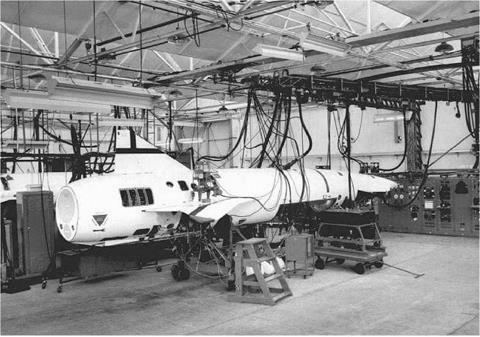 Blue Steel eventually came into service with the RAF in a limited capacity at the end of 1962, although it was not until April 1964 that clearance was given for a filled and fuelled operational Blue Steel to be used with the Vulcan Quick Reaction Alert. However, its reliability was not good: in 1963 the RAF estimated that the chances of a powered missile being fit for powered launch at the target was around 40%, and of these, only about 75% would reach their targets. The Victor squadrons were operational until 1968, when they were retired from the Blue Steel role. The Vulcans continued with the missile until 1970, when it was withdrawn from service. Figure 35. The Stentor rocket motor as fitted to Blue Steel. It is difficult to avoid the conclusion that HTP/kerosene was a poor choice of propellants for Blue Steel, and that Avro, completely inexperienced in missile development, was a poor choice by the Ministry of Supply for its development. Both these factors extended an already critical development time and led to many operational difficulties. The delays in the programme, the cost overruns and the difficulties involved in handling the missile all conspired to reduce even further the reputation of the British aircraft industry. Blue Steel would be replaced by Polaris, then by Trident – both American-built. It is now half a century from Blue Steel, and Blue Steel was the last offensive British missile to be developed and deployed.